The Chula Vista Resort is located a bit off the beaten path in a lovely spot next to the Wisconsin River. It features two indoor water parks with an impressive assortment of attractions. At a combined 110,000 square feet, it boasts one of the largest indoor water parks in Wisconsin Dells--and the world, for that matter. Among the featured attractions is the Fly'n Mayan, an uphill water coaster, the Matador Mat Racers, and Jungle Adventure, a bowl ride with lights and music. The resort also offers a good-sized outdoor water park. During the warmer months, guests can tackle a variety of tube and body slides, including The Cyclone, a massive enclosed slide. In addition to the water parks, the Chula Vista has a large expo and convention center, meeting and conference facilities, a golf course, a sports complex, spa, golf course, arcade, and a large number of hotel rooms and condos. The resort also features a theater with Vegas-style family shows. Among the many on-site dining choices is a steak house, a buffet-style restaurant, a sports bar, and a pizzeria. The physical address is 2501 River Road in Wisconsin Dells. From Madison/Milwaukee/Chicago: I-90/94 West past Madison to Exit 87, Wisconsin Dells Hwy 13. Hwy 13 North for 2.8 miles, left onto Chula Vista Parkway. Registered hotel guests receive passes to the water parks as part of their room rates. Day passes to the water park are also available for the general public. Compare rates for Chula Vista Resort at TripAdvisor. 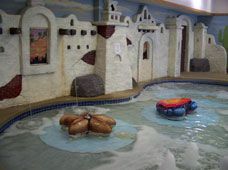 Uphill water coaster, lazy river, family raft ride, bowl ride, speed slides, an interactive water play structure with a tipping bucket, body and tube slides, mat-racing slides, indoor hot tub.